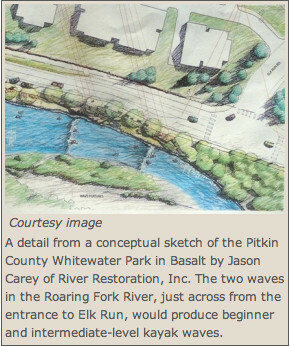 Construction is complete on the new whitewater park on the Roaring Fork River in Basalt. Now, just add water. Two features that create a wave effect were added about one-quarter mile upstream from the confluence with the Fryingpan River. There will be a lower volume of water flowing on the Roaring Fork River than on the Colorado, so Basalt’s whitewater park might appeal to users with a wider range of skills. The two features were installed on a stretch of the river between Fishermen’s Park on the east and a string of riverside commercial development to the west. The features are across Two River Road from the entrance to the Elk Run subdivision. Two concrete pilings were driven into the riverbed and capped with material that looks like rock. They are separated by about 150 feet. Each of the structures creates a wave that water enthusiasts can play on. Each has a calmer pool just downstream. When construction started in September, officials said the upper feature will be more “radical” while the lower one would be gentler and accommodate more users with a broader range of skills. MacArthur said kayakers will find both features alluring. The gentler feature also will attract stand-up paddlers, he said. He anticipates use to start later this month and stretch into early fall. Carey said a track hoe and other heavy machinery needed to build the project were out of the river by March 15, as required by a U.S. Army Corps of Engineers permit. A temporary dam was dismantled last month and water restored to the main channel. Water was diverted into a side channel for six months — when the flow was at its lowest. Pitkin County Healthy Rivers and Streams budgeted $770,000 for the project. The project also gives Pitkin County the ability to call for water in that stretch of river in certain circumstances. That will benefit a stretch of the river that usually has low flows during dry summers, county officials said during public meetings about the project.